With fishing as their motivation, but simply relaxing as their true goal, a small group of men recently gathered by pond in Cornwall on a perfect autumn morning. With clear blue skies above and mist rising off the surface of the calm water, it was the ideal place for a brief escape from today’s fast paced world. With the expectations of society resting heavily on the shoulders of young men, it’s little wonder that, behind closed doors and bottled up inside, is a silent issue that for many that at best causes worry and at worst can result in the tragedy that is suicide. Fishing for Positive Mental Health was an event that the organiser Alex Ledbrooke wanted to offer following the loss of a good friend in November 2016. Alex and his late friend John, built a friendship around fishing. The times by the water were good times but they masked the struggles and mental health issues that John was battling with. Talking about personal feelings and personal troubles is a difficult subject for young men. The expectation is for them to be strong, confident and able to cope with everything life throws at them, yet for some, and understandably so, this simply isn’t the case. And without an outlet for release, seemingly small problems can grow and manifest themselves as mental health issues. It was with a little trepidation that Alex decided to invite men in Cornwall to join them for a morning’s fishing, to experience the benefits that come from being outside, close to water and away briefly at least, from life’s pressures. The morning of the event started with a quick walk through of the basic tackle that would be used, simple casting techniques, baiting up and how to unhook a fish. 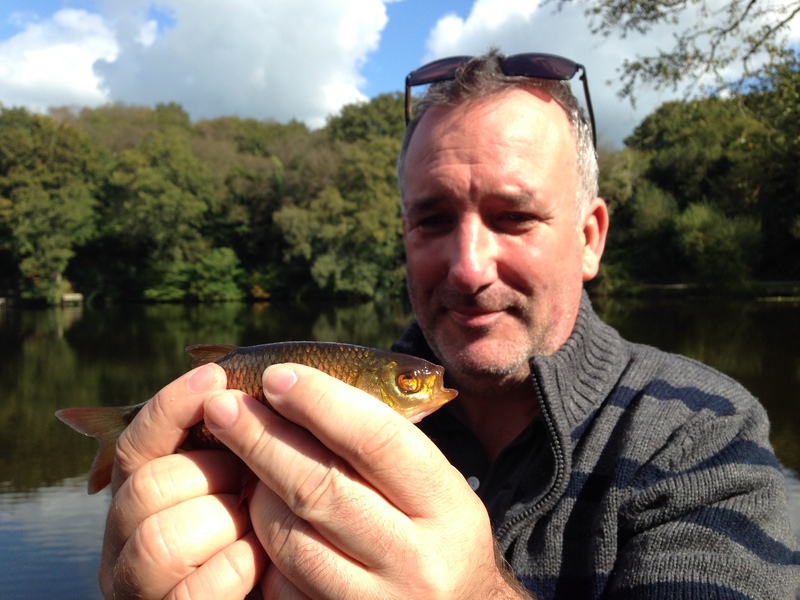 Almost immediately the first fish, a superb roach came to the net of one of the guests, Paul. Paul suffers from Post-Traumatic Stress Disorder or PTSD. Just leaving the house was a big deal and he admitted, meeting a group of strangers was a hugely nerve wracking affair. With help from members of the Samaritans in Cornwall who kindly volunteered to attend the morning and provide emotional support, Paul and others had the chance to talk and seek advice and guidance on how to move forward and overcome their troubles. The volunteer members of Roche Angling Club also played a vital role in coaching the guests through the basics of fishing and using that vital skill of just listening. How do I catch fish “On the Drop”?